civil service,corruption,decentralization,electoral campaigning,empowerment,federalism,gendered democracy,globalization,gridlock,hybrid systems,imperialism,judicial review,liberalism,media,parliamentary models,party systems,political culture,populism,presidentialism,privatization,public opinion, referendums, republicanism,revolutions,security,social democracy,sovereignty,statelessness,trade unions,Westminster model. Joe Foweraker is Professor of Government and Director of the Centre for Mexican Studies at the University of Essex. He has written comparative accounts of social movements, citizenship rights and democracy, in addition to monographs on grassroots politics and democratic change in Brazil, Spain and Mexico. Currently he is working on a global analysis of democratic performance. 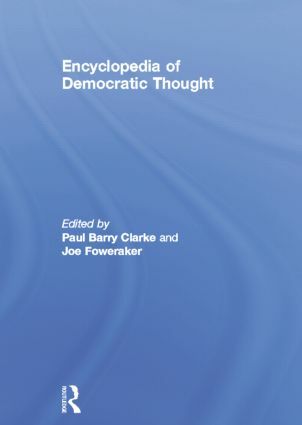 Paul Barry Clarke is a Senior Lecturer in Political Theory in the Department of Government at the University of Essex. He has written extensively on the relationship of the individual to the modern state, the concept of political autonomy and the changing nature of citizenship in modern democracies.